I got busy with life and neglected to pay much attention to my gardens for a week and then, wow! My perennial flower gardens exploded in full and lush growth. Welcome to May in the Pacific Northwest. We alternate between a few days of warmth and then days of intermittent weather with at times heavy, heavy rain showers. Viburnum 'Snowball Tree', thick with blooms after a heavy rainfall...it got a haircut. 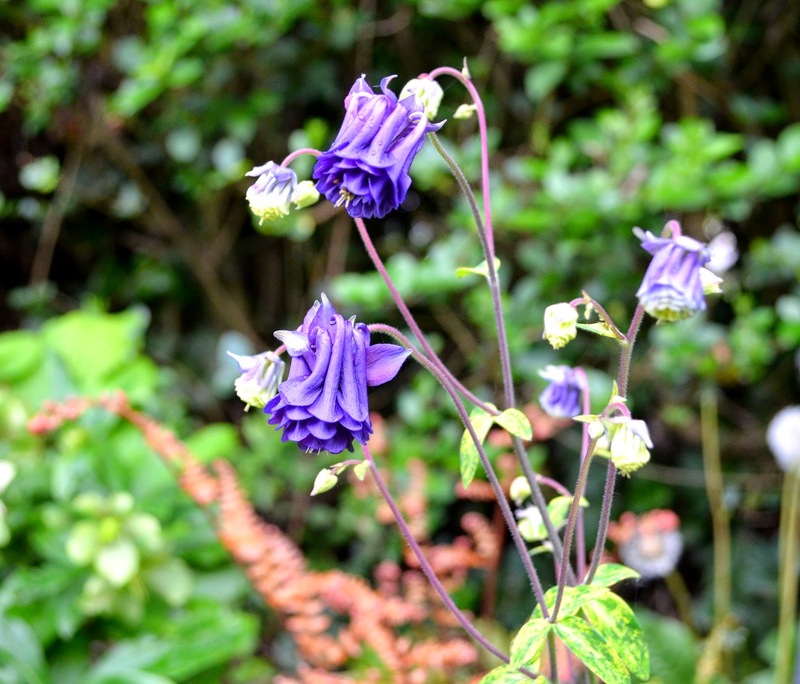 I guess I could call May the month of Aquilegia. My little girl and I started many from seed year and in the fall we planted them in our shade gardens. We have both been delighted to see the blooms this spring. 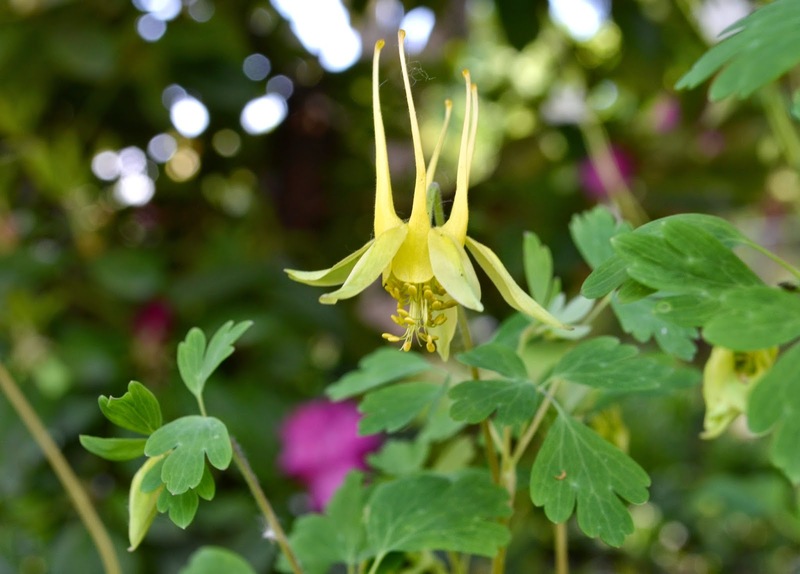 Aquilegia 'Leprechaun Gold' a start from my blogging friend Alision! 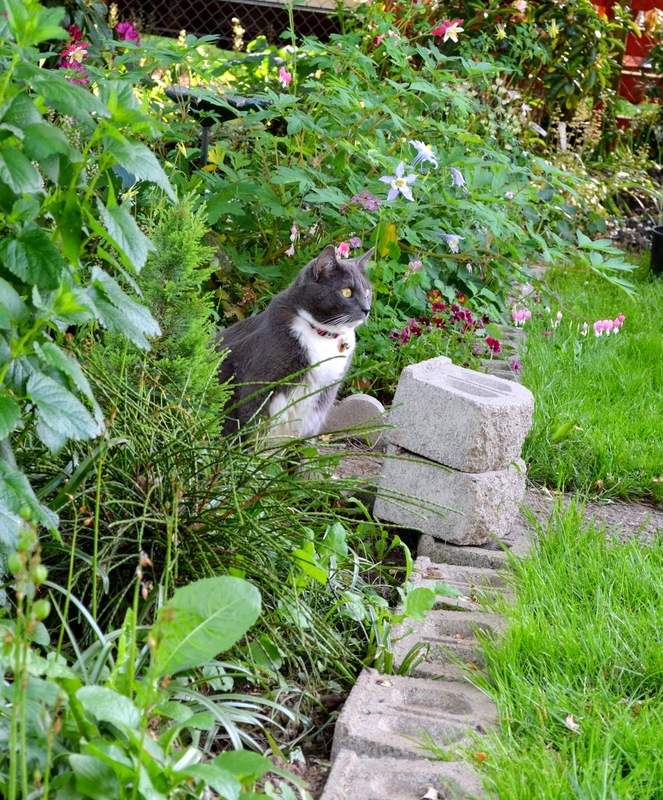 I have personal garden guards as well. 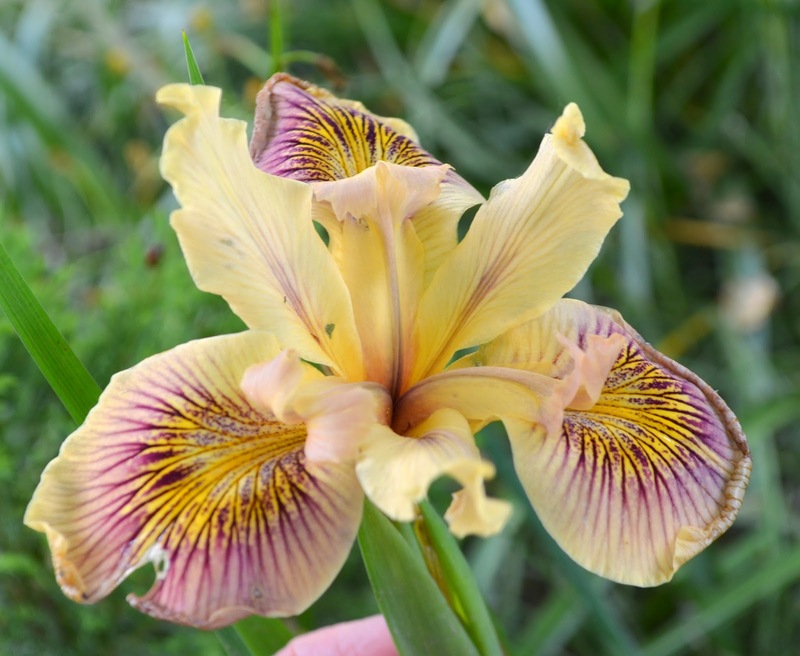 My blogging buddy Alison also gave me starts of darling Pacific Coast Iris. I could seriously develop an addition to Pacific Coast Iris. If you are interested in these beauties, Oregon based nursery Wild Ginger Farms has a great selection. 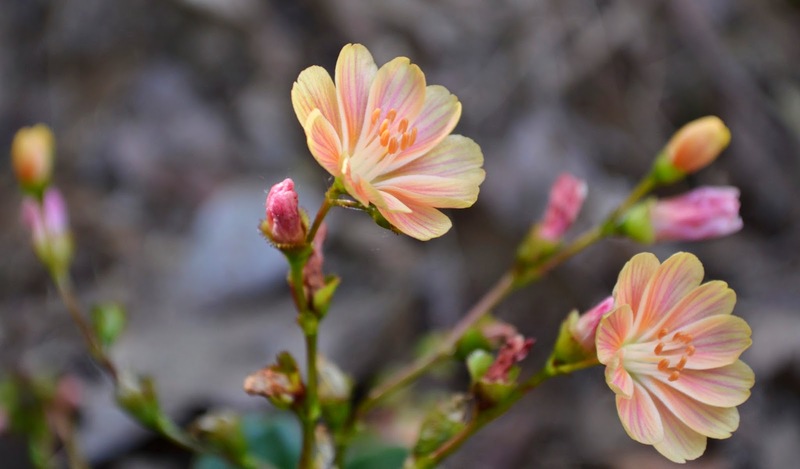 I visited Wild Ginger Farms at a plant sale recently and purchased Lewisia cotyledon 'Kanab' after reading fellow bloggers rave about it's hardiness and drought tolerant nature. I had just the spot that needed a fix of color. And lastly, one of my favorite perennials is my pink lupine. 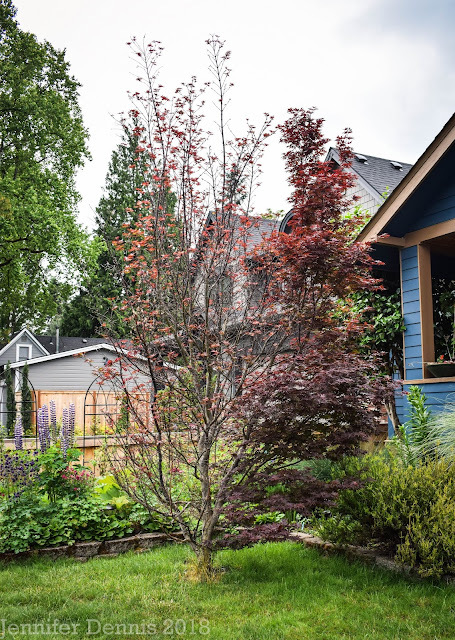 May in the gardens is lush with green foliage, filling the empty spaces and building blooms that will bud come summer. May is a lovely month in the gardens. 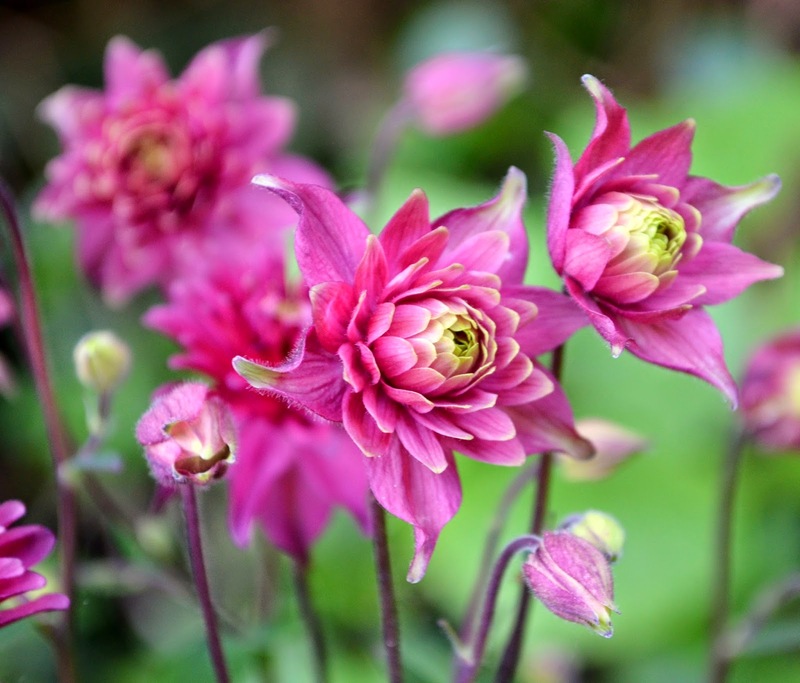 Join Carol over at May Blooms Gardens and see what is blooming around the world. What beauties you have growing there!!! Everything looks lush and wonderful. Beautiful! I keep hoping we can find a house in West Linn. It is a neighborhood we keep looking at. The flowers you show always leave me longing for wetter places and more, more, more flowers in my life! Gorgeous shots! 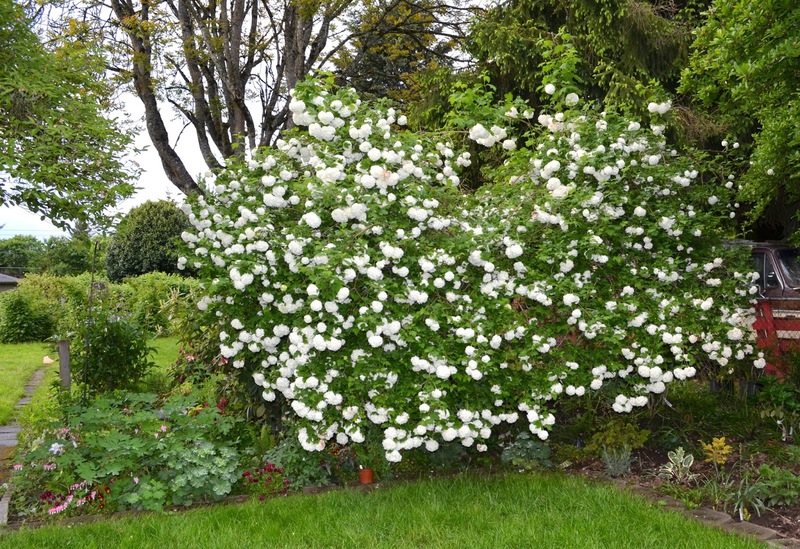 There is an ancient 'snowball' bush at the corner of our house, which was there when we moved in. I never realized it was a viburnam! Thank you. So many lovely flowers but I think that last shot is my favorite. 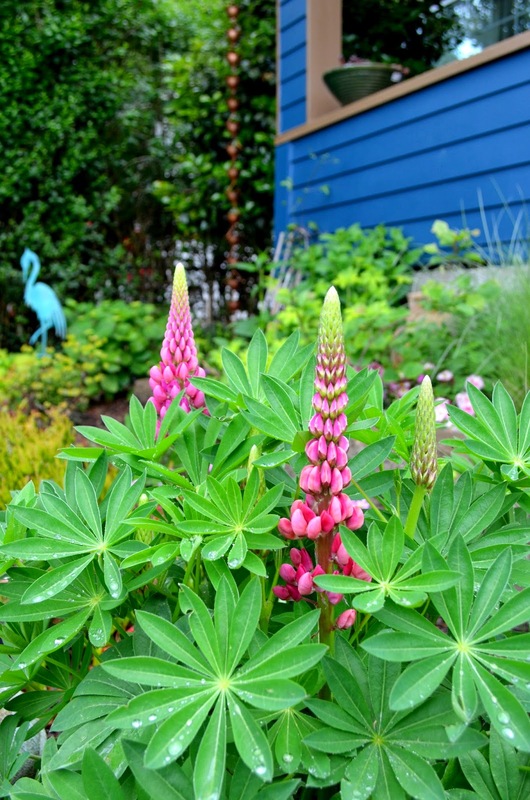 I have a soft spot for lupine foliage and the color of the flower against your house color is perfection! I love lupines too. I started a bunch from seed this spring with hopes to place about in the back perennial beds. What lovely blooms you have. I love lupine, too. The ones I've got grow wild up on our back slope, and are all purple. Since that soil is straight clay and they seem to be thriving, I'm thinking about buying out all the lupines I can find and filling the slope with them. Everything else seems to die off up there anyway. :) Also, my columbine are just starting to bloom. They are so pretty and dainty. Love all your flowers, but especially the PCIs! 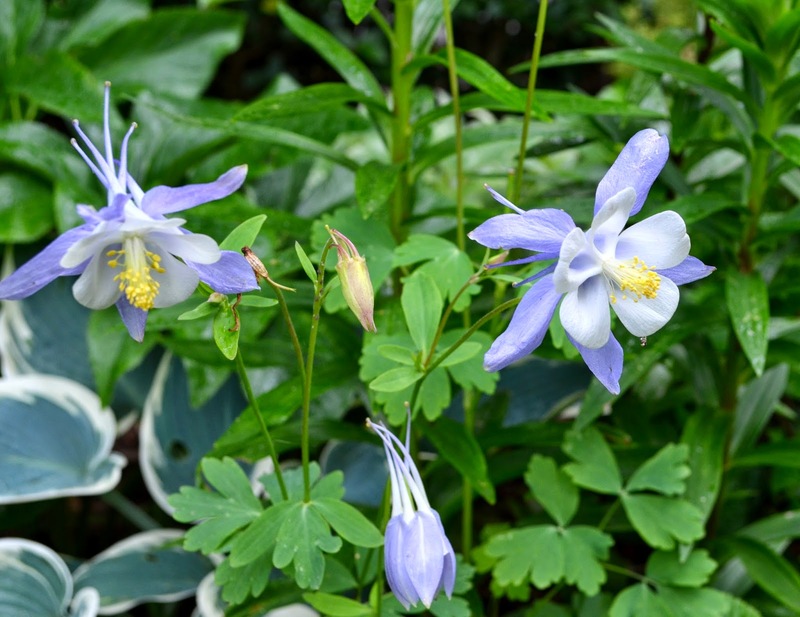 The Columbines are lovely too, and so easy to start from seed. The PCI's came from you! I am lusting over them. 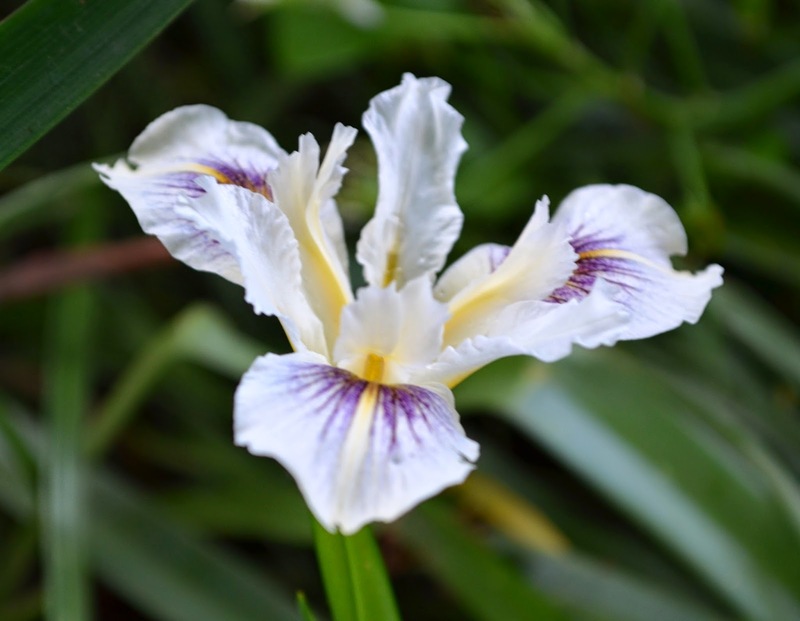 I have space were I planned to cultivate an iris themed garden and well, now I know what to fill it with! Jennifer, you have a lovely display going on here! The columbines and lupines especially caught my eye. Enjoy! 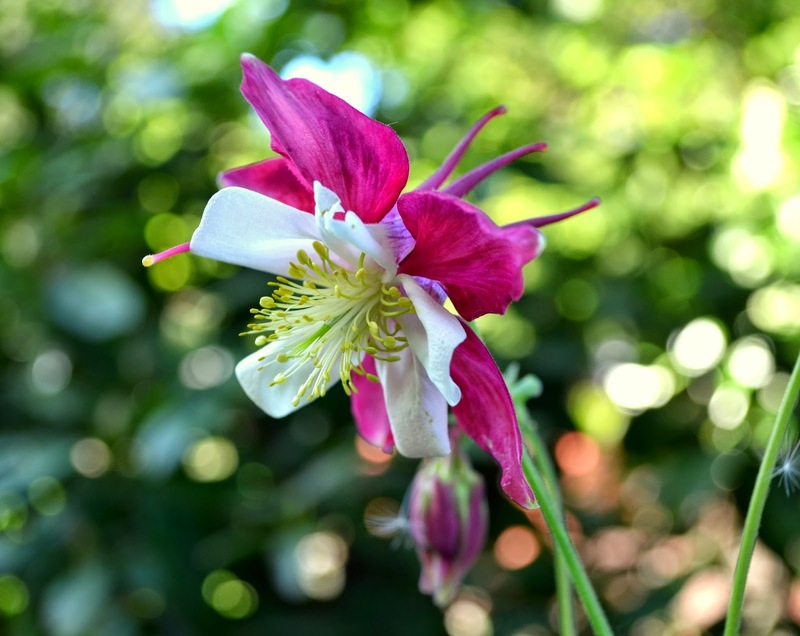 I wonder if your many columbines will cross breed and give you some interesting new forms. You are really putting that camera to good use. Happy Bloom Day! Oh, everything looks so beautiful! I'm jealous of your lupines--mine have been pretty anemic this year.